The Illuminati uses movies to expose their plans in plain sight. Most people think they are "just movies" to "entertain" us. Nothing could be further from the truth. May 29, 2015 Disney production called: "Tomorrowland"
In the movie, the Illuminati cast themselves as heroes who are warning humanity of its demise. By failing to heed our “benefactors”, humanity’s fate is sealed. They are portraying themselves as our "benefactors". They are calling evil, good and good, evil. The "Tomorrowland" film takes aim at the Watchmen on the Wall. "March 13, 2015. the new Disney movie "Tomorrowland" is filled with Illuminati subliminal messages, Satanic images, Satanic symbols and it is predictive programming. "George Clooney, an Illuminati puppet plays the lead role of this film. He has been used as a puppet in other movies, such as the men who stare at goats. This movie is an externalization of the hierarchy. It is letting the public know in their subconscious what they want them to think. They are telling us that the society they are bringing and is planned is one of peace. The Truth is that they are bringing in the beast system for the Antichrist (dead Pope John Paul ll) as they move us towards one world government, one world religion, one world economy. Jesus Christ tells us in the King James bible that a time of tribulation the world has never known is coming. The DAMNED reject the warnings from the Watchmen on the wall, who warn the people: If you do not receive Jesus Christ as your personal Lord and Saviour, repent of your sin, ask by faith to be filled with the Holy Spirit, study the King James Bible to show yourselves approved unto God and seek God with your whole heart, then Eternity in hell is your destiny. Ezekiel 3:18-19 : When I say unto the wicked, Thou shalt surely die; and thou givest him not warning, nor speakest to warn the wicked from his wicked way, to save his life; the same wicked man shall die in his iniquity; but his blood will I require at thine hand. Yet if thou warn the wicked, and he turn not from his wickedness, nor from his wicked way, he shall die in his iniquity; but thou hast delivered thy soul. March, 2009 the movie called: "KNOWING"
Is there a connection between the movie and Flight MH 17? The 777 planes have a Rolls Royce engine, the engine in the ctv news picture at the link above is not a Rolls Royce. The picture is deception. This link below shows the turbofan engines for the 777. Definitely not a match! July 21, 2014 Satellite Image of Flight MH17 Debris Field! Black Box Turned Over To Malaysia! In the video clip above, to learn what the numbers that appear before 42 on the left are, and to see the whole sequence of numbers on the paper, click on the link below to see the paper image magnified. Take the last 20 and place it to the left. You should get: 20 14 24 171 . 7 is JULY, the 7th month. Bring the first four digits to the right. That is 20 14. The date reads 17th July 2014. 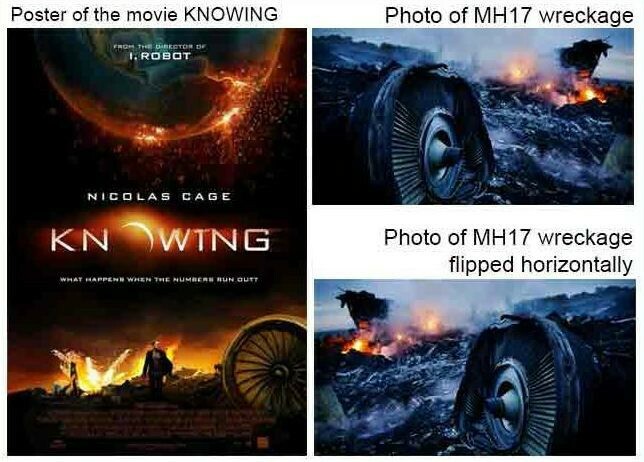 The movie is associating this date with a plane crashing to the ground, leaving wreckage very similar to MH17. The reason for the scrambling around of the numbers, was so it wouldn't so easy to figure out. Did you notice the very last two digits in the sequence of numbers? The last two digits are: 33. This is the signature of the Illuminati. Notice the "17" in the Knowing poster. Now look at the O. It is a crescent moon, which looks like the number 7 at the shape and angle it is being used. The image on the tail of the crashed plane on the "Knowing" cover, slightly resembles that of the Malaysian Airlines logo? Also you can make out the letters "AIR" as well. News media are currently focusing on whether the MH17 plane was shot down or it crashed. They are saying that witnesses describe a plane falling out of the sky with: NO WING! - pronounced "Knowing". It is possible that no-wing means the plane was not in flight when it exploded. Maybe the crash was staged and a dummy plane was blown up while on the ground, complete with cadaver "passengers". There is video evidence showing that something blew up on the ground, not in the air. If so, flight MH17 would be unaccounted for, as well as MH370, not to mention a clone reportedly sitting in a Tel Aviv hangar. Notice in the sheet of paper http://www.pixhost.org/show/292/22488371_knowing-screen-numbers-paper-1.jpg with the complete sequence of numbers, there aren't very many more numbers left after 17th July 2014. The KNOWING sequence finishes after a few more numbers. This means that time is fast approaching for the event, in the end scene, that looked like a nuke exploding in New York City to become reality. Everything around you is a matrix. It is a matrix in the sense, what you see is not what is real. It is "rigged reality". Everything is manipulated to look real. Your mind is victimized by the lies and deception. Jesus Christ can set you free from the chains that bind you, if you receive Him in to your heart, and repent of your sins. Most people in America have been brought up on Walt Disney movies. Our minds are influenced by the Satanic education system, professional training, movies, TV, and other media. Our minds are programmed through deception of reality - how to think, how to act, and how to react. In the video above, pause this @ 30 seconds and you will clearly see 6/21 count 5 numbers to the right, 4 1 3 9 8 reversed zip code Duckwater NV? You will see the number 11 after 41398 ...together 6/21/11 = 9/11 or is 41398 = 25 = 7/11=18=666 cypher codes? After the 11 679= 22 after 679 numbers blurred by the director, Pause @ 47 seconds, kid says a map puzzle or something key word PUZZLE, 4+7=11 numerology 666 subliminal date 6/21/2011 appears the SUMMER SOLSTICE and Prince William's B-day? It is a different set a numbers from numbers on 30 seconds Summit Entertainment = the Pyramid, Escape Artist = the All Seeing Eye subliminal imagery date: 6/21/2011 9/11 also = 13, 13 Illuminati Bloodlines ? Illuminati Earthquakes Tornadoes natural disasters? unfolding now 2011 in sequence. Mind control is any sensory stimulation below an individual's absolute threshold for conscious perception. A subliminal message is a signal or message embedded in a other medium designed to pass below the normal limits of the human mind's perception. Predictive programming exists in many Hollywood movies like Knowing. It showed the BP oil spill before it even happened Japan's Earthquake/Tsunami 3112011. Tornadoes in April and May, June 21, 2011 - New Madrid Faultline? Blood Sacrifices 2011 2 = twins /11 .. look outside the box! Director Alex Proyas new project in pre-production now! PARADISE LOST...the War in heaven with Lucifer, Michael and his Angels ILLUMINATI the ring of fire .the New Madrid? 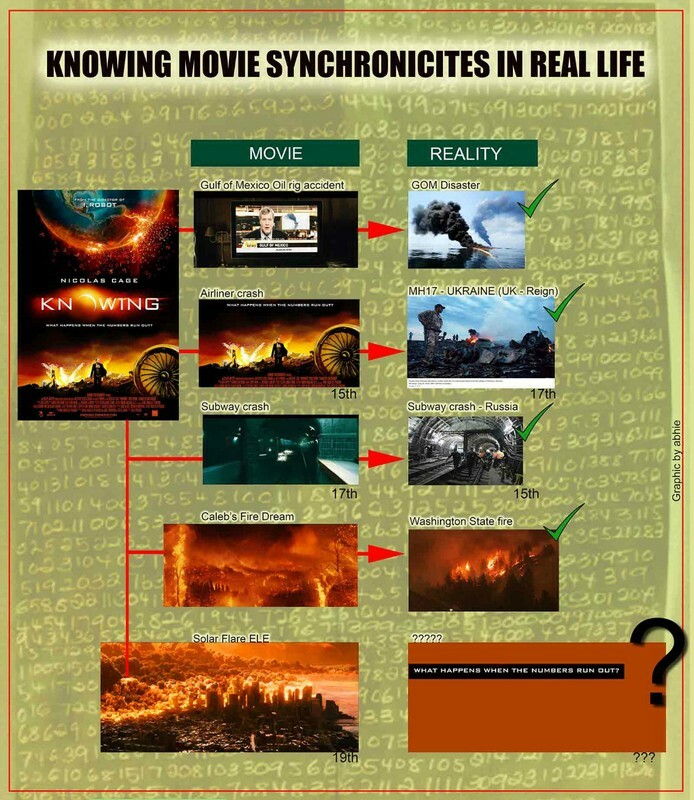 This presentation is about a scene in a TV News report of Hollywood movie "KNOWING" in 2009, a report exactly the same mentioned an Oil Rig Explosion in the Gulf of Mexico become reality in April 20, 2010. Many speculations and discussions on what reason behind the incident, people want to KNOW if is it an accident (?) - the norms and reaction in the headline news pointing a conclusion - The Timing imply a conspiracy theory and sabotage. The movie "Knowing" predicted the 3/11/11 Japan Earthquake Disaster. 2011 Illuminati Predicts 11/11 Japan Disaster in the movie Knowing!! What is the significance of Aliens in the movie? Aliens will be used when the Antichrist appears. The Illuminati plan events 50 years in advance. The India Independence, something all people from India are so proud of, was planned 50 years prior to 1947. The idols worshiped in India, were British puppets. WW1 ended with Palestine under British control and the land set for the return of the Jews. World War 2 ended with the holocaust and the Jews fleeing to Israel. I believe that WW3 will end with both Israel and the world set up for the end time prophetic events, the arrival of the Antichrist, Pope John Paul II and the Second Coming of Jesus Christ. The song "We are the world" was not about unity among all people. It was about the New World Order referring to themselves as: "we are the world". Music is a powerful medium. It is used by the New World Order to influence the population and manipulate the emotions of the listener. The New World Order owns and controls all mainstream media sources. Lyrics from "We Are The World"
In 1985, and for many years afterwards, the population of the world, through this song, were led to love by the same forces who are now leading us to hate. The Illuminati use the globalist owned Mainstream media mediums and Hollywood productions for their plans and for their purposes. This song, "We are the World" was used to manipulate the emotions of the listeners, and through the use of mind control strategies, impart in the minds of the people of the world the desire for "brotherhood" and "unity" (globalization) in the world. This was the purpose of the creation of the song, by design, to be used by the Illuminati for that period of time. In the song, the Illuminati stated: "There's a choice we're making We're saving our own lives". This is a satanic, antichrist statement. Jesus Christ is the only One who can save lives from hell. The performers in the song are actors, acting their parts on cue, as puppets for the New World Order. Boycott the antichrist products being sold to your spirit and soul by way of the globalist run "Hollywood", mainstream media and publishing houses. Turn off the television, and disconnect the cable or satellite TV service, do a spiritual inventory of your life. Throw out anything that is ungodly. Receive Jesus Christ as your Lord and Savior, repent for all your sins, ask for forgiveness, ask to the filled with the Holy Spirit, pray, read and study the King James Bible and grow in Grace and Truth. Guard your heart and mind in Christ Jesus. July 18, 2014 Malaysian Plane Crash - notice the shadow in the upper right corner of the camera filming the "event". And ask yourself, why was this person in the middle of nowhere with their camera turned on unless they were expecting an explosion on the ground? This video also identifies the Crisis Actors used in the video above.